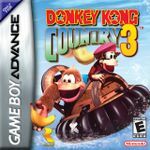 As the final game in the SNES trilogy, Donkey Kong 3: Dixie Kong's Double Trouble is a platform game featuring plenty of bad guys and tons of secret areas. The Kremlings have a mysterious new leader named KAOS and are definitely up to no good and have actually captured Donkey Kong and Diddy Kong themselves! This time it's up to Dixie Kong and the infant Kiddy Kong to save the day. In this game, you can actually travel on the overworld map and find secret locations through the use of different modes of transportation that you unlock throughout the game. Donkey Kong Country 3: Dixie Kong's Double Trouble was released for the SNES in 1996.